All recessions have commonalities as well as unique characteristics. The National Bureau of Economic Research, a private non-profit organization, is the widely-recognized arbiter of recession beginnings and endings. To survive the next recession, whenever it comes and however it looks, sketch out your contingency plans now. The headline question appeared in Quora: Will the Next Recession Be Any Different? It's a good question, so let's delve into. All recessions have commonalities as well as unique characteristics. Before looking at the likely characteristics of the next recession, let's take a look at history for common trends and possible differences. And before that, let's review the definition of recession. The National Bureau of Economic Research, a private non-profit organization, is the widely-recognized arbiter of recession beginnings and endings. It says "During a recession, a significant decline in economic activity spreads across the economy and can last from a few months to more than a year. Similarly, during an expansion, economic activity rises substantially, spreads across the economy, and usually lasts for several years." It also notes that within an expansion, a brief period of decline can occur, and during a recession, a brief rebound might happen. And NBER emphasizes the spreading of economic decline across sectors. They don't use the label of recession when a single industry goes into a slump, but that slump does not spread widely. An example of such a non-recession was the oil industry collapse in 1986. Oilmen felt a severe decline, and Texans thought they were in a recession, but other industries and other parts of the country were expanding quite nicely. Now for the commonalities: In the post-World War II era (the period I have the most knowledge of), all recessions have been preceded by Federal Reserve tightening. The Fed's fingerprints are on every recession, though in some cases other fingerprints are also present. Other contributing factors include the housing bubble and financial collapse of 2008-09, the buildup and slowdown of Y2K spending along with the dot-com bust of 2001, the drop in consumer attitudes during the first gulf war in 1990, the steelworkers' strike in 1959, and so forth back through history. Now let's address the question of what the next recession will look like. If we have a recession begin in 2019 or 2020, the Federal Reserve overreaction will likely be a cause. Right now, I don't see the Fed making a big mistake, but that's hard for even the best economists to see in real time. The case I worry about the most is the Fed leaves monetary policy unchanged through late 2019, the economy shows strength and inflation accelerates, and then the Fed decides it's behind the curve and slams on the brakes. That is a story more about 2020 or 2021 than 2019. It is not my most likely forecast, but it is my biggest worry. Global economic decline is possible, but usually not severe enough to trigger a U.S. recession. The Asian financial crisis of 1997 was hardly felt in America. Today European economies are weakening, with Brexit throwing a monkey wrench into many businesses' plans. U.S. exports to Europe, though, do not constitute a large part of our economy, about 2.5 percent of GDP. 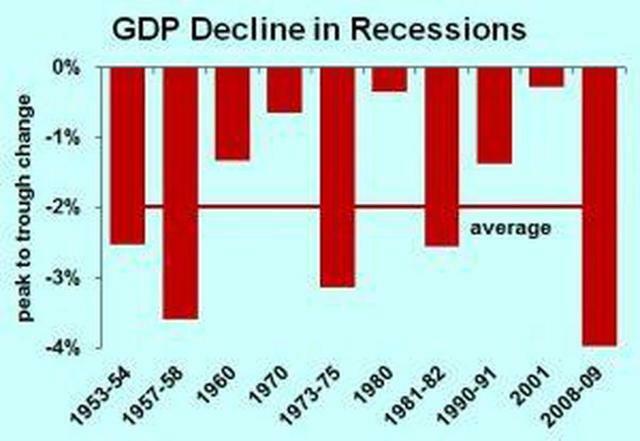 A severe recession in Europe would not, by itself, trigger a recession in the U.S., though it would slow down economic growth. Financial crisis seems unlikely. The stock market may seem high, but a drop in stock prices by itself is not recessionary. To get a financial crisis, we need too much speculation, and I don't see that happening. Some pessimists point to high housing prices, but our actual construction is right in line with needs generated by population growth. (More on this in a later article). So my best guess is that the next recession, whenever it hits, will be a garden-variety Federal Reserve over-tightening recession. New housing construction will be hurt the most, car sales will drop, business capital spending will decline, then other discretionary consumer spending. Interest rates will drop, first from market dynamics and then pushed down further by the Fed, and inflation will decelerate. Some consumers and some businesses have stable income and will decide that it's a dandy time to spend, especially on interest-sensitive purchases. Economic growth will spread across the economy and the recession will be over. Although the business cycle is uncertain, one thing we can be sure of is that surviving a recession is more likely for businesses, families and governments that take prompt action with a well-conceived plan. Prompt action is critical, but very hard psychologically. Cutting back spending is not fun, and human nature is to delay. But survivors don't dilly dally when times get hard and change is necessary. Plans that are well-conceived are also crucial, as panic-driven actions are less likely to succeed. Plans developed during good times are not only going to be more consistent with long-term strategy and values, but also plans already developed will be executed faster than spur-of-the-moment ideas. To survive the next recession, whenever it comes and however it looks, sketch out your contingency plans now.